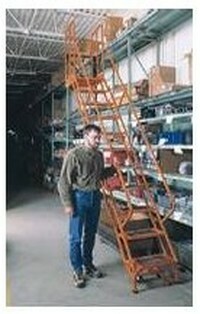 Cotterman Easy Climbing Ladders - "Stairway Ladder"
Articulated Ladder System - Little Giant etc. Front Loader, Snow Plow, Dock Loader, Sweeper, Misc. Spreader Beams, Load Lifter, Hoist Magnets, Misc. Vestil Rolling Ladders Cotterman Rolling Ladders Cotterman Easy Climbing Ladders - "Stairway Ladder" Cotterman Work Platforms & Trailer Access Ladder Ergonomic Work Stands Work Platforms - Lift Truck Mounted Cross-Over, Cantilever, Dock and Speciality Ladders Powered, Manual Lift Platform & Tanker Ladders Cotterman Tilt-N-Roll Ladders Office Rolling Ladders Aluminum Rolling Ladders & Work Platforms Aluminum Gangway Ramps Track Ladders - Library or Industrial Folding Step Ladders Articulated Ladder System - Little Giant etc. Designed to provide safe, convenient access to tall rack shelving. A comfortable 50° stairway with large tread steps and handrails allows easy ascent and forward descent. A 42" guardrail extends above the ladder for use while standing on the large 27" deep top platform. Manually propelled, the ladder rolls smoothly along the length of the stockroom aisle and the upper rolling carriage and its swivel casters at the bottom of the ladder. 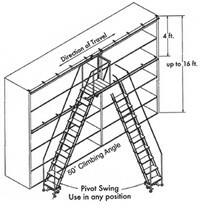 The swivel casters are easily activated or deactivated permitting the ladder to be moved to each position. It sits firmly in its rubber pad legs while in use. In addition, the carriage itself incorporates a pivoting design to allow easy inward and outward movement of the ladder around aisle- or rack-mounted obstacles. From the chart below select the proper track height range. (Keep in mind to calculate the distance from the floor to the desired track mounting surface which should be no more than 4 feet below the top of the highest merchandise to be reached. Choose the number of steps and platform height closest to your calculation. The lower track is mounted 4 ft. below the upper track trolley track. Use the C-L15 brackets (2 ends per track run and 2 ft. maximum center spacing), #78 track and joint dowels. Choose the tread width of the ladder desired, 16" or 24" and type of tread.